We certify counselors, teachers, therapists, medical professionals, artists, and others who help children and adults suffering from abuse, illness, grief or stress in Art4Healing® method. Trainees learn how to use the language of color to facilitate creative and emotional expression. Methods include abstract painting and other visual mediums, such as collage and journaling. Additionally, trainees facilitate workshop segments at Art & Creativity for Healing partner workshops under an experienced Art4Healing® mentor-facilitator. Lastly, trainees partner with an experienced Art4Healing® mentor-facilitator to experience our volunteer work. What are the specific requirements? 45 hours on-site at the Art & Creativity for Healing studio, including the courses listed below. 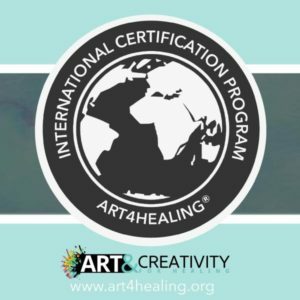 This hands-on, introductory workshop for the Art4Healing® Certificate covers the methods of Art4Healing®. Students express feelings through the language of color and painting on canvas. This two-day, weekend class teaches students how to conduct their own Art4Healing® workshop. We cover topics such as creating a comfortable and safe environment and practice facilitating Art4Healing® projects. Our Art4Healing® series contains exercises covering the language of color and how to express and process it through visual art. To start, beginners use collage, watercolor, acrylic painting and journaling to complete a series of artworks. Next, intermediate participants complete an additional series of artworks using these varied mediums, taking the process to a new level of emotional expression. Finally, advanced participants focus on acrylic painting to explore and process creativity on a deeper level, completing an additional series of paintings. Where can I use the certification? Graduates can use the Art4Healing® method in their practice to supplement existing art, educational, or other therapy. Laurie Zagon, founder of the Art4Healing® method and co-leader Nancy Stewart-Torbitt, artist/educator provide all of our certification training. Brandman University is ranked in the top tier of Western Regional Universities and colleges in the U.S. News and World Report’s: America’s Best Colleges. Brandman University is also one of only 100 American colleges and universities to be recognized by the prestigious Templeton Guide: Colleges that Encourage Character Development. Brandman University offers 4 graduate-level professional development units for this certificate. Art materials fee payable on first day of class to Art & Creativity for Healing Inc.